Along public pathways, visual signs and audio cues are used by pedestrians to guide them into forming smoother pedestrian flows. However, often ignored or neglected, these signals require greater pedestrian attentiveness and appropriate conscious effort. To solve this problem, we have proposed the concept of “vection field”. 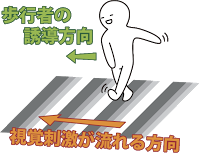 This is a field of optical flow that cues movement according to a pedestrian’s motion. Visual stimulus within this optical flow leads pedestrians innately in specific directions without requiring direct interventions. We have implemented such a field by covering the ground with a lenticular lens screen; in this setup, neither power supply nor position tracking of pedestrians is necessary. An experimental result from our previous study shows that a vection field can direct pedestrians to one side. However, the quality of the optical flow such as image clarity and smoothness of motion was unsatisfactory in that it could cause a reduction in leading inducement. In this paper, we describe in detail a new display method involving a lenticular lens screen that yields an improvement in the quality of the vection field and ultimately pedestrian optical flow. Experiments showed improvements over previous attempts.